A career in sport management requires more than a love of sports; it requires a thorough understanding of this multi-faceted, multibillion-dollar business. At STAC, we teach you to apply business and marketing techniques to the sports world. You’ll take courses ranging from economics and promotions to event management and sports law. You’ll also complete an internship, where you’ll gain valuable experience and make important industry connections. 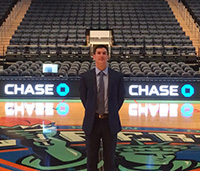 STAC students have interned for the New York Mets, New York Jets, CBS Sports, and the YMCA. When you graduate, you’ll have management and leadership skills necessary for a leading role in the business side of sports. Read about Pamela Rodriguez's internship with the NY Jets. St. Thomas Aquinas College students will have the ability to begin working toward their Master of Professional Studies degree in Sport Management at St. John’s University while completing their bachelor’s degree through an affiliation agreement between the two institutions. This will provide you with an advantage and head start in their graduate studies in a growing field. Sports management is a competitive, but thriving industry. Potential employers include sports agencies, sports marketing firms, professional and amateur sports organizations, high schools, colleges, sporting facilities, retail, fitness centers, and sports media. “I learned a lot from talking with my teachers outside of class, not just during class. They were a wealth of knowledge about the industry, professional sports, and what I’d need to do and take to land a job related to sports management."